Description of "The Shadow of Darkness "
When Maya fought two criminals one night and saved herself and her five year old daughter, Sejal, she thought the worst was over. But was it really? Or, there could be something worse than the worst? The childhood trauma that little Sejal did not deserve resulted in nightmares, trust issues and bizarre habits. Even after thirteen long years, the night continues to haunt and debilitate her senses with its magnificence, and as if it wasn’t enough, an encounter with the remains of past slips her deep into a treacherous darkness. Priyanka Baranwal has authored It’s Never Too Late...to fight against your biggest enemy: Fear. She loves reading, writing, blogging, poetry, playing Guitar, music, travelling, and jogging. She is also the owner of Pick’A Book Club - For Kids which she runs from home. The club has been founded in order to instill love for book reading in kids. The Shadow of Darkness is her second book. 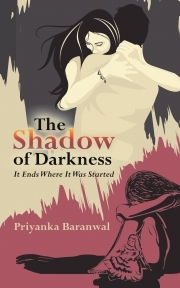 Reviews of "The Shadow of Darkness "
The Shadow of Darkness is a story revolving around Maya and her daughter Sejal. The book is very well written and edited with no grammatical errors. The plot sequence and events occurrence are perfectly merged and put into words. The story connects emotionally to the reader in which the author has very beautifully shown almost all important relationships that one have in their lives - especially the mother-daughter relationship and a relationship between best friends. Though at a point you get jumbled up with too many people and their names, but the character development was done perfectly. The writer has not only realised the issues women face un this world but also how men are being a victim of the pain and torture. How a mother got strength to fight demons just because she wanted her daughter to get the living she deserved and how she recovered being a brave and a better version of herself in future. Not setting with her past, how she helped others and served the society. Highlighting the struggle and the way to break free, how to overcome past emotional trauma, importance of family, love, relations and how sharing our problems with loved one's helps us mentally. To sum up, it is a motivating and very realistic read. • The more you run, the faster it catches up with you. • When you need to decide your next move, try to buy it. • It&apos;s okay to lose confidence. It's okay to feel helpless at some point. It's okay to feel weak at times. We all get scared but it is not okay to withdraw ourselves to the situation. • Gathering courage and fighting our battles make us true human beings.